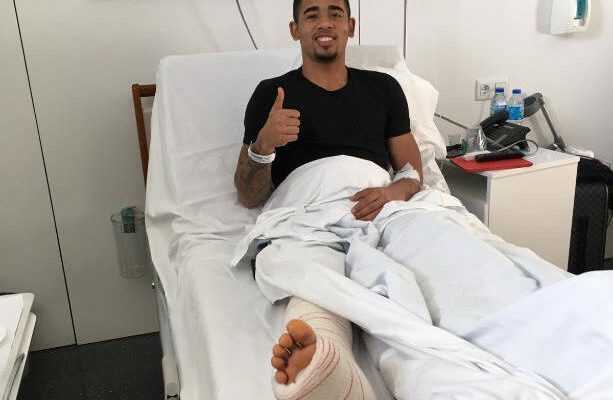 Manchester City’s Gabriel Jesus will be out for between one and two months with a knee injury, says boss Pep Guardiola. The 20-year-old Brazilian striker went off in tears during the first half of Sunday’s 0-0 draw at Crystal Palace. And Guardiola confirmed the expected length of his lay-off after Tuesday’s 3-1 home victory over Watford. But the City boss must now wait for news on the fitness of full-back Kyle Walker, while doubts remain over playmaker David Silva’s future availability. Tuesday’s victory sent City 15 points clear at the top as they showed no ill-effects from the end of their 18-game Premier League winning run at Palace. But Guardiola warned the festive period is “going to kill the players” after his side played their 10th game in a month.